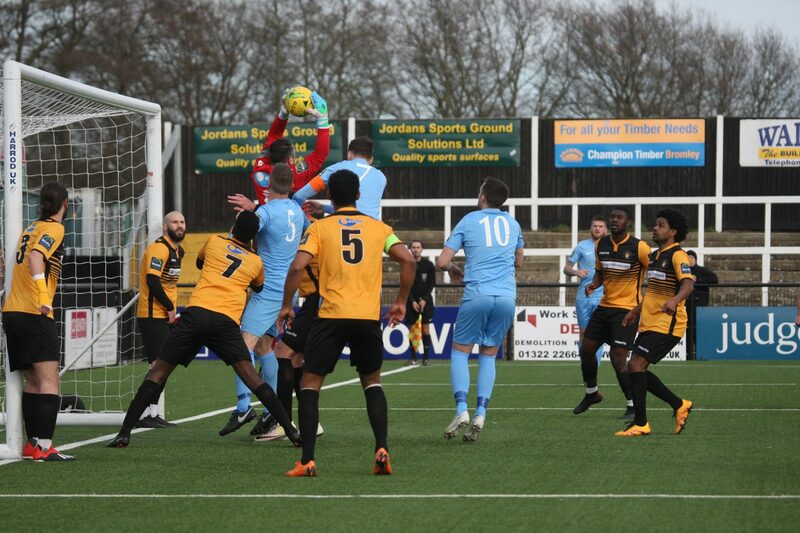 The Cray Wanderers machine rolled inexorably towards its first ever Isthmian League title with a clinical and business-like victory over the Hornets, on an afternoon when very little went right for Dom Di Paola’s side. Already trailing to a Junior Dadson goal, Horsham lost the luckless Lewis Hyde to injury, conceded a second half penalty, and were made to play the final twenty minutes with only ten men following the dismissal of Dan Pearse. If that wasn’t bad enough, results elsewhere saw their three point cushion over third place whittled away through wins for fellow promotion hopefuls Ashford United and Hastings. This was, though, a fairly unmemorable match that failed to live up to its billing as the division’s Match of the Day. The rapidly changing Hayes Lane is more used to hosting four figure crowds in the National League, when landlords Bromley are at home, so it was a rather subdued atmosphere created by an attendance just past two hundred and perhaps it was this that failed to inspire either side who didn’t really get out of second gear. Or maybe it was Cray’s surely insurmountable lead at the summit that meant, regardless of the result, it wouldn’t have much of a bearing on the destiny of the league crown. Be that as it may, the travelling faithful made their way to Kent in good spirit, boosted by last weekend’s 2-1 win over Hythe Town and their side’s unbeaten run of seven matches. The Hornets showed just one change to their starting eleven, with Kieran Lavery’s inclusion relegating Chris Smith to the bench alongside the returning Steve Metcalf who had missed the previous two games. Cray, too, made just one difference from that which recorded its twenty-first win of the season away to Phoenix with Sean Roberts coming in for Tom Phipp, while new signing from Greenwich Borough, defender Tom Carlse, was named among the substitutes. The home side got proceedings underway but Horsham quickly wrestled possession away and Harvey Sparks’ cross was claimed by goalkeeper Nick Blue and another from Lavery was just too high for George Hayward at the far post. It was an encouraging opening two minutes by the visitors but Cray hit back immediately when Ben Mundele took advantage of a lucky ricochet off Sparks to strike a left-footed drive that Josh Pelling did well to parry. Straight back up the other end, Rob O’Toole won his side a corner that was cleared only as far as Pearse, whose long range effort was blocked by Archie Johnson. As if to give everyone a breather after such an open start, it was a full ten minutes before either goal was threatened again but, even then, Karl Dent’s low drive failed to trouble Pelling. It was developing into a cat and mouse tussle with the hosts happy to build from the back, typically with each of their three main defenders getting a touch of the ball before the move got beyond halfway, in contrast to the Hornets whose predilection for the ball down the wings or over the top for the ever-willing O’Toole to chase had yet to reap any rewards. But then, on nineteen minutes, Lavery did well to put Lee Harding away and his low square ball to the edge of the six yard box seemed certain to produce the game’s first goal but O’Toole was denied by a terrific close range save by Blue. A goal then might have made all the difference for the Hornets, or perhaps it would have merely antagonised Cray into going into overdrive – we’ll never know – but we might have done had Harding not strayed marginally offside in the visitors’ next attack, after being found in lots of space on the edge of the penalty area. But such small margins can prove pivotal when playing the champions elect and, sixty seconds later, the Wands went ahead. There was an element of good fortune in the build-up as Jerome Frederico came through a fifty-fifty challenge with Sparks but then showed him and Dylan Merchant a clean pair of heels as he raced on into the penalty area before pulling the ball back for Hudson to calmly stroke the ball home at the far post. But credit to the Hornets who went straight back on the attack and, after Hayward and Sparks had combined to win a corner, O’Toole’s looping header was comfortably claimed by Blue. A soft free-kick awarded against Hayward had to be scrambled clear by Pelling and his defence in what was the final piece of action for Hyde before making way for Metcalf, with everyone hoping this latest setback in an injury-hit season for the current Player of the Year is to be a short one. Scarcely had Metcalf been on the pitch than Pelling had to come smartly off his line to deny the impressive Bradley Pritchard before Pearse brought the first half to a close when he collected a throw from Hayward and struck a twenty-five yarder too close to Blue, who comfortably gathered. A Cray free-kick, just minutes after the restart, saw Sean Roberts slice an attempt over the bar after Dent’s cross had only been headed out as far as the edge of the penalty box by Harding. The Hornets almost levelled in rather fortuitous circumstances on fifty-four minutes when Harding received a throw from Metcalf and whipped in a near post cross that hit Lavery on the heels, needing a sharp reaction save from Blue to prevent the ball from crossing the line. A timely slip by Joe Taylor gave Sparks the opportunity to get back and clear the danger after the unmarked striker was cleverly put through on goal by Pritchard, but Taylor was sure-footed enough to extend the hosts’ advantage just moments later when Merchant scuffed a clearance from Johnson’s cross and Joe Shelley’s desperate attempt to stop Dent from lashing the loose ball at goal ended with the Cray midfielder crashing to the deck. A spot-kick was the obvious decision for referee Isaac Searle and Taylor did the honours, sending Pelling the wrong way from twelve yards. Once more, though, the visitors looked to strike back almost immediately when a devilish low cross by O’Toole cried out for a finish but Johnson did superbly to prevent Harding from getting a telling touch to the ball and the danger was averted. Just before the midway point of the half, captain Jack Brivio was replaced by Tyrell Richardson-Brown but, within minutes, the Hornets were down to ten men when Dorking loanee Pearse was shown a red card for a crunching challenge on Frederico. Despite calls for his dismissal from a group of partisan home fans, most in the ground were rather surprised at the referee’s decision but, rather than sparking another home rout, Horsham would go on to have arguably their best period of the match. Two minutes after the sending-off, the ball was worked from one side of the pitch to the other with O’Toole and Lavery advancing the move on and the latter laying the ball off for Sparks to hit a powerful angled drive that the safe hands of Blue were equal to. Horsham’s next attack was very similar in its construction but this time it was Mitchell Nelson who blocked a shot from the left foot of Sparks. With a little over fifteen minutes to go, the Hornets brought on Smith for Lavery and reverted to three at the back in a valiant effort to get something from the match and, shortly after Pelling and the linesman’s raised flag had denied Cray a third goal, Harding sent a blistering drive just past the upright from thirty yards to which Blue barely moved. The Hornets’ frustrations were growing and both Hayward and Harding were booked, the latter for showing his disapproval at the award of a corner following a mazy run into the box by Pritchard. Johnson joined an attack for the home side and, following a neat one-two between Frederico and Taylor, the full-back took aim from distance but dragged his shot wide. The travelling fans lent their support to claims for a penalty when Smith’s penetrating run and cut back hit Nelson but both he and referee Searle were adamant the ball had hit the Cray skipper on the chest, rather than the hand. In the final minutes, a tiring O’Toole was robbed of the ball on the far touchline by Dadson who raced on and blasted a right-footer wide of the target. A free-kick by Smith was well held by Blue before the final action of the game came when Johnson managed to skip past a couple of half-hearted challenges and send in a cross from which Dadson forced Pelling into a save. The final whistle went, shortly after, to leave Cray needing just three victories to be crowned champions while Horsham move on to relegation-threatened Greenwich Borough next Saturday in search of three valuable points.